30-Apr-2008 -- After bagging 25N 31E we headed over to Aswān where we spent the night and fixed a slow puncture. However we discovered another slow puncture in the morning which had also to be repaired and delayed our departure until nearly 9:30. We headed out on the Abū Simbel road until we came to a track marked on the map that led up close to Kurkur oasis. This turned out to be a minor improved road that was rough but steady going. We climbed up the first scarp passing an abandoned military checkpoint and then turned right towards Kurkur. It was an easy drive through some small jabals where we startled a gazelle before dropping into the oasis. There were some fairly recent tracks leading into the oasis and the remains of a recent camp fire beside some empty fuel drums. As oases go, it was about normal at this point, a few palm trees, acacia trees, and some grass. However there was a bit of a bend a few hundred meters away and it looked like there was more vegetation round the bend, so we drove over. It was spectacularly green with grass and more trees covering a large area of wādiy, the most vegetation I have seen at one of these remote uninhabited oases, and I was impressed. There was a small one-man hut in the middle of the grass that had recent tracks up to it. Not sure what it was used for but reminded me of the type of shelters that falcon trainers use. We then back tracked to the old road and carried on south-westerly. Here we startled another gazelle which instead of running away from us ran across our path at over 40 km an hour and came within 10 m of the car, quite a spectacle. The road eventually turned and climbed a jabal to an abandoned army camp where it ended. 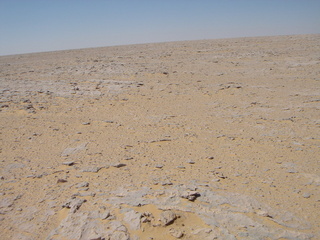 We returned to the plain and carried on where we again picked up the camel trails which we followed until we came to a range of jabals extending down the scarp. Here we planned to try and follow some tracks I had received from some surveyors who had been in the area some 13 years before. We got up the first level of the scarp before we picked up their tire tracks and then followed them up the second level and out on top. They then ran across an area of white limestone that I thought would be rough going and we planned to skirt round the white area to the South onto what appeared to be brown gravel plain that I hoped would be better going. With this course we would not get within 20 km of 24N 32E, which also lay in an area of white limestone. All in all I thought the terrain would severely discourage an attempt on the point. However with Eddie in charge of navigation and learning the Ozi software on my mobile, we tried following the tracks and the going was better than expected. We would loose the tracks as they crossed areas of pure exposed limestone but picked them up again by picking the best terrain several times before loosing them for good. However I kept going with the terrain and the going was good, much better than expected but not really taking us where we planned to go. I have to question Eddie's motives here, either he was struggling to master navigation on the screen of a cell phone, or he had been bitten by the confluence bug and knew where he was! After a while I stopped to check our position and we were only 10 km from 24N 32E with open terrain in front. The temptation was too great and we headed for the point. We started to encounter rough broken limestone about 4 km from the point but we progressed carefully until we were within 1 km where it got a lot rougher. Since it was lunchtime it was prudent to stop and walk the last km to save the tires. Eddie and I headed off on foot leaving Riḍā and Halīm to prepare lunch. It was an easy walk and a quick zeroes' dance but we struggled to get the Zeroes on both Garmins. It was then back to the cars for lunch and head for the dark brown wādiy complex that I though would offer good going. This turned out to be correct and we had an enjoyable cruise for 40 km along the wādiy bottom before it narrowed, started filling with sand and getting softer. We managed to get both cars stuck, which took a bit of getting out before we picked a camp spot for the night. I had really enjoyed the wādiy drive, only coming across a few tire tracks in the 40 km emphasizing how infrequently this area has been visited. The night was still, the stars bright, and the beer cool as we savoured the somewhat unexpected but welcome bag and we had lasted a whole day without any punctures. Four punctures the following day made up for that but that is another story.